When Dr. Harry Blum had the first major showing of his art in 1999 at a New York City gallery, it was more than an average art-world milestone. Dr. Blum was 100 years old. 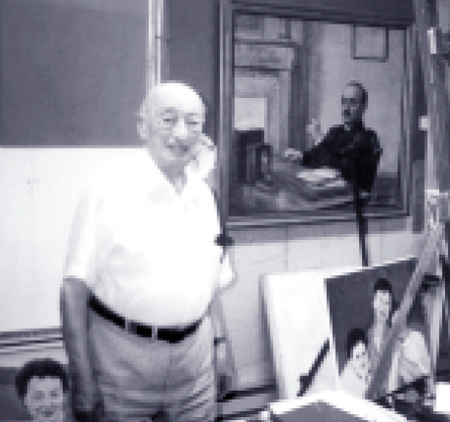 But painting past 100 is hardly the only example of Dr. Blum’s tireless energy. He didn't retire from his medical practice until the age of 95. At 99, he was still driving — the state Motor Vehicle Department found his eyesight was 20-30 and the local office had a birthday party for him, with cake and candles, when he renewed his license on his 100th birthday. A native of the Ukraine, Dr. Blum was born on Christmas Day in 1898, and came to New York when he was seven years old. He grew up in Brooklyn, graduated from New York University School of Medicine and maintained a successful practice in Brooklyn until 1994. He began painting at the age of 35 under the tutelage of a French artist and almost immediately won an award from the San Francisco Museum of Art. But it was not until he was 95 that he was able to take up painting full time. He and his wife, Reggie, came to Ridgefield in 1943 and had a 25-acre farm on Route 7 between New and Stonehenge Roads for 50 years. From the 1950s into the early 1970s, they operated a well-known mink farm on the property. When he died in 2004, Dr. Blum was 105 years old. Dr. Blum’s work has been praised by critics and even coveted by a thief. Four years after his death, a woman was arrested for stealing one of Dr. Blum’s works, which had been donated to a Jewish community center in Southbury. The woman was already facing charges in connection with the theft of more than 150 artworks from Connecticut museums, churches, historical societies, libraries, and schools, and was being held under $1.2-million bond.